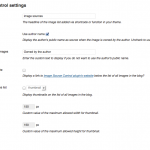 More reliable image sources in Image Source Control 1.6. Image Source Control version 1.6. fixes a major bug when activating image sources on bigger blogs. Read more about this issue here. After several weeks of programing, I finally uploaded Image Source Control 1.3.0 to wordpress.org. For me, this is a huge milestone in the solution for a great image source plugin for WordPress. Let me tell you about the great new features of this version in this article. 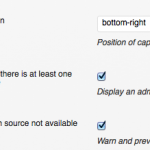 We just released version 1.1.3 of our Image Source Control Plugin for WordPress. It comes with a shortcode for a paginated list of all images connected to posts and pages.This might help you and your readers to easily find images you had seen before, but don’t remember exactly where.